Big Dave Orr was truly one of the giants of baseball in his day, not only in stature but with the impressive statistics he accumulated in his short career. Dave was tragically struck down by a paralyzing stroke in the prime of his career and likely lost his place beside contemporary first basemen like Charlie Comiskey and Dan Brouthers in Baseball's Hall of Fame. David L. Orr was born in the Richmond Hill section of New York, New York, on September 29, 1859, to Irish immigrant parents James and Rachel Orr. James was a stonecutter, while Rachel kept the house and raised David and his older brothers James, George and William. All four sons were born in New York City. Dave attended elementary school in New York but it appears he did not attend high school. Orr would only spend one year away from his beloved Brooklyn and that was to play baseball for the Buckeyes of Columbus, Ohio (American Association) in 1889. Dave was married to Emily Ann Orr who passed away in 1906. The couple did not have any children. At 5'11" and 250 pounds, Dave's size did not hurt his ability to hit for average throughout his career, nor did it seem to hamper his agility playing first base. During his eight-year major league career Orr never hit below .305 and his .965 fielding average over that same period was very respectable. In fact Dave led all American Association first basemen in fielding in 1886 with a .981 fielding percentage. Nonetheless, his massive size was a major factor in his career-ending stroke, suffered at the age of 31. Dave's first taste of organized baseball came with various clubs in the northeast, including Newark, Hartford and a Brooklyn team called the Alaskas. Orr was both a right-handed batsman and thrower. Dave finished the 1883 season as a fill-in player for the Mets, mostly for injured regulars. In only 13 games and 50 at bats, Orr was able to leave a good impression by batting a very respectable .320. Unfortunately Dave's father passed away that year and did not live to see his son make a name for himself in the Majors. 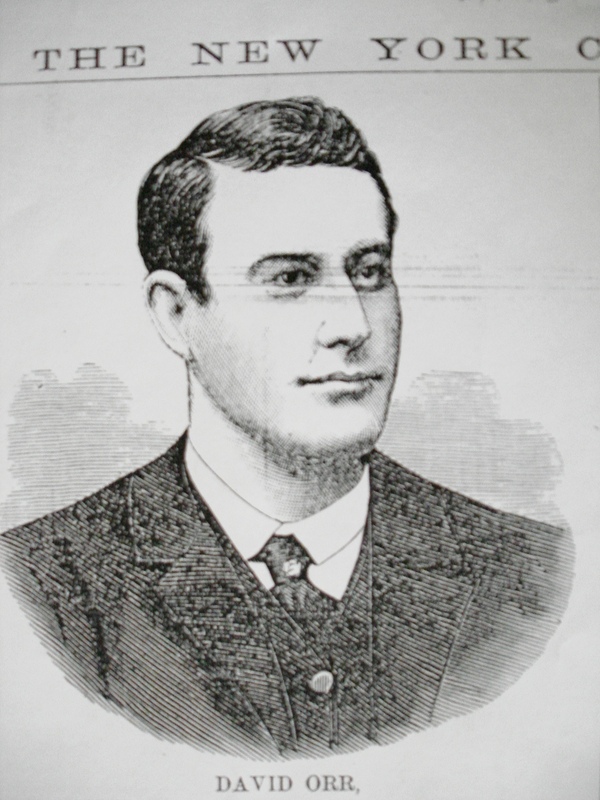 Only three players of the nineteenth century won the equivalent of baseball's Triple Crown: Paul Hines (Providence, National League, 1878), Tip O'Neill (St. Louis, American Association, 1887) and Hugh Duffy (Boston, National League, 1894). In 1884, Dave Orr's first full season in the majors, he came two home runs from winning his own Triple Crown as he led the American Association in batting at .354 and RBI's with 112. His nine homers were two shy of tying John Reilly of Cincinnati for the title. In addition, Orr finished in the top 10 in several other categories including hits, total bases, extra base hits, slugging percentage, games played, doubles, triples and on base percentage. The 24-year-old also led the Mets to their first pennant, as they paced the American Association by 6 1/2 games over Columbus and earned a trip to the first "official" World Series. The only blemish for the season for Orr and the Mets was getting drubbed by the powerful Providence Grays in the World Series in three straight games. In fact, none of the games were close and Orr managed only a single hit for the series. In 1885 Orr followed his sensational rookie season with another big year. Although the Mets finished in seventh place, 33 games behind the St. Louis Browns, Orr ended up second to Pete Browning in the batting race (.342). Orr also managed to lead the circuit in slugging percentage and triples while finishing in the top ten in home runs, total bases and extra base hits. On June 12th Big Dave went six for six at the plate while hitting for the cycle, one of just four players in the ten-year history of the American Association to accomplish the latter feat. It was obvious that John Day put more emphasis on his National League Gothams than he did on his Metropolitans, as he essentially used the Mets as a farm team for his League squad. With the decline in his team's fortunes, Orr was even called on to pitch. Dave pitched in 3 games totaling ten full innings with no decisions, but a 7.20 ERA. As remarkable as Orr's first two seasons in baseball were, his best year was his third, 1886. Dave repeated as slugging king of the Association with a .527 mark. He also topped the league in hits, a career best 193, set a major league record with 31 triples (still second-most in history, and the most for a right-handed hitter), and became the first player in major league history to total 300 bases in one season. His career-high 63 extra base hits also led the league. Tack on the third best batting average in the league (.338) and the second most homers (7), and it was clear that Orr was one of baseball's premier hitters. Orr also had a fine year in the field, pacing league first baseman with a .981 fielding percentage and 1445 put outs. Once again, however, Orr's fine performance could not translate into wins as the hapless Mets finished in seventh place, a full 38 games behind the St. Louis Browns. In 1887, Dave had another fine year, though not up to par with his first three seasons. While belting out a .368 batting average, he also had to deal with some injuries (including one suffered in a collision with teammate Pete Sommers), and he only played in 84 games, his career-low. With the team struggling to stay alive and compete, the Mets called on Orr to manage the team, and he replaced Bob Ferguson in mid-season. Orr managed only 8 games, going 3-5, before giving way to O. P. Caylor. This would be the final act for the woeful Mets, as the team folded at the end of the season after finishing 50 games behind the St. Louis Browns. The franchise was gone after only five years, and Orr was sold off to the new Brooklyn Bridegrooms. Dave's first year with the new Brooklyn team, 1888, was not a particularly good one for him, although the team was successful. While the Dodgers finished second in the Association, only six-and-a-half games behind the perennial champion Browns, Dave managed to hit only .305, the weakest average of his career. (Balancing that, the Washington Post, in its May 7, 1888 issue, reported, "Dave Orr is said to be the most popular man on the Brooklyn Club.") Once again, Dave played less than 100 games due to injuries, and at the conclusion of the season he was sold to the Columbus Buckeyes. In Columbus, Orr was named team captain, and his play seemed to be rejuvenated. At the age of 29 Orr had gained respect throughout the league and enjoyed one of his finer years in baseball with the Buckeyes. Orr finished the season in the top 10 in several offensive categories including his fourth place showing in the batting race with his .327 average. He also finished high in hits, RBIs, doubles, triples, total bases, slugging, and extra base hits. While his recent Brooklyn teammates captured the Association pennant, the Buckeyes would finish the 1889 season in sixth place. Dave had a hand in helping Brooklyn win the 1889 flag, as this story from the January 7, 1906 Washington Post attests: "Perhaps the most historic hit ever made was a swat that Big Dave Orr gave the ball at Columbus, when, with one blow, he knocked St. Louis--the three time champions--out of their fourth pennant and gave Brooklyn the flag. The situation was a fair one to dream about! One ball to decide a pennant. The pitcher heaved up the ball and Orr swung. There was a crack and the ball started toward the city. It crossed the right center fence, still going higher. It crossed the canal, hit just above the second story window of a cottage, bounded and rolled up an alley- and the Comiskey's men yielded the pennant." (The author of this article miscalculated St. Louis's dominance as they had won four straight pennants and were attempting to gather their fifth consecutive flag). After the 1889 season, Dave joined many of his fellow players in joining the newly formed Players League. The Columbus club was not happy at all with their star captain jumping ship. Ironically, the change moved Orr back to his hometown of Brooklyn where he was named captain of the Brooklyn Wonders managed by John Ward. The Wonders, often referred to as "Ward's Wonders," finished in second place just six-and-a-half games back of the Boston Reds. Orr was now 30 years old, but showed he was still a fine hitter by posting a career high .371 mark, losing the league crown by two points to Pete Browning. Orr was again among the league leaders in several categories including batting, slugging, hits, RBIs, total bases and extra base hits. As the season ended, it was clear that Dave Orr still had plenty of good years ahead of him. With the demise of the Players League, after just one season, we can only speculate where Orr's career would have taken him, what accomplishments lie ahead. Tragically, Big Dave Orr was stricken with a career ending stroke just a few weeks after the 1890 season ended and just days after his 31st birthday. His left side was completely paralyzed. The stroke occurred while he was competing in an exhibition game against a local team in the tiny town of Renova, Pennsylvania. Just weeks after his stroke, Orr was reportedly telling friends and teammates he would return to the game of baseball after rehab. He never did. Dave's brilliant baseball career was over. In only seven full seasons, Orr left an indelible mark on the game of his time. He may have been the best player in his league four different times, including his last. He led his team in batting average each of his eight seasons in the majors, and is the best all-time hitter for three different franchises: the Metropolitans, the Buckeyes and the Brooklyn Wonders of the Players League. Dave's .371 batting average in his final season is the second best "swan song" campaign, trailing only Shoeless Joe Jackson's .382 with the 1920 White Sox. Dave's lifetime bating average of .342 is tied with Babe Ruth for 11th all-time and is the 3rd highest ever for a right-handed hitter. Life with paralysis would not be easy for Orr. In his passion to stay with the game, he frequently umpired games, including major league contests in Brooklyn. He also did odd jobs, working as a watchman, laborer and stagehand. He worked as a caretaker for the new Ebbets Field (which opened in 1913) in Brooklyn and in 1914 worked at Washington Park for the Brooklyn Tip Tops of the Federal League as a press box attendant and gate guardian. On June 6th, 1915 Dave died of heart disease at the age of 55, joining his beloved Emily (who had passed away in 1906) at Woodlawn Cemetery in the Bronx. Orr has also been immortalized in Columbus, Ohio, at Cooper Stadium, home of the Triple-A Columbus Clippers, on its Wall of Fame. Even though Dave only played one season with the Columbus Buckeyes, he ranks as one of the best hitters in the five-year history of the Buckeyes Franchise. Had Dave Orr not encountered his tragic stroke he likely would have played ball for several more years and warranted careful consideration for the Hall of Fame. In David Nemec's classic book on the American Association, The Beer and Whiskey League, the author names Dave Orr as the best first baseman in league history. Baseball history has many tragic stories of ball players cut down in their primes with career ending stories including Roberto Clemente, Thurman Munson, Addie Joss and Roy Campanella. Dave Orr is also on this list. Dave Orr is a forgotten baseball hero of the 19th century and it's a tragedy that he along with a few others from that era are not in the Baseball Hall of Fame in Cooperstown as true pioneers of the game. Ball, David. American Association History Project. SABR. Campbell and Rucker. Baseball's First Stars. SABR, 1996. Dewey and Acocella. Encyclopedia of Major League Baseball Teams. Harper Collins, 1993. Faber, Charles F. Baseball Pioneers. McFarland, 1997. James, Bill. STATS All-Time Baseball Sourcebook. Stats, 1998. Jones, Donald D. Former Major League Teams. 1995. Lansche, Jerry. Glory Fades Away. Taylor, 1991. Lansche, Jerry. The Forgotten Championships (1882-1981) . McFarland, 1989. Nemec, David. The Beer and Whisky League. Lyons, 1994. Nemec, David. The Great American Baseball Team Book. New American, 1992. Nemec, David. The Great Book of Baseball Knowledge. Masters, 1999. Pietrusza, David. Major Leagues. McFarland, 1991. Shatzkin and Charlton. The Ballplayers. William Morrow, 1990. Tiemann and Rucker, Nineteenth Century Stars. SABR, 1989. Tootle, James R. Baseball in Columbus. Arcadia, 2003. Westlake, Charles W. Columbus Baseball History. Pfiefer Printing, 1981. Wright, Marshall D. Nineteenth Century Baseball. McFarland, 1996. The David Orr files at the National Baseball Hall of Fame.